The English Bridge Union is committed to the development of Bridge, and consequently puts great emphasis on education and learning. These pages have something for everyone: for those wanting to learn how to play, for those wanting to teach and for those who want to become tournament directors at local club, county, national or even international level. The English Bridge Union works closely with the charity English Bridge Education & Development on all education matters relating to bridge. Be sure to check out their web pages. The EBU runs a range of competitions and events for less experienced players. Please click here for further information on our Really Easy Programme. Love Bridge? Why not teach it?! Do you love bridge? Do you want to share this enthusiasm with others? Do you want to make bridge more than just a hobby? If 'yes' then you should attend one of our Club Teacher Courses and learn to be a bridge teacher. These very successful and popular courses will help you learn how to teach bridge using the Bridge for All Programme, expertly guided by one of our very experienced tutors. You can learn more about these courses using the link for Club Teacher Training to the right of this page which also provides details on courses which are planned. We set up these courses across England in direct response to demand, so if your club or county needs new blood and you are ready to help bring newcomers into our great game, why don't you get your club/county secretary to get in touch to see what can be arranged? The course is also an excellent starting point for those who want to teach bridge independently. Read more about our teaching community by reading the EBTA link in the Education Menu on your right. We are pleased to announce that, in conjunction with English Bridge Education & Development, free places on Club Teacher Training Courses are being reintroduced in 2019. These courses, which are run by EBED and available to EBU-affiliated clubs, are intended to enable members with a motivation to help bring more players in to the game - and specifically in to their club - to run lessons. A list of the courses which are currently available, can be seen on the EBED website. It is intended that more will be added in due course. Information on how affiliated clubs can apply to attend the course at no cost is also available on the EBED site. We are delighted to have presented the Alec Salisbury Award to Deb Casey of Claremont Fan Court School, in Surrey. The Alec Salisbury Award is awarded jointly by the EBU and English Bridge Education & Development to a serving school teacher who has made a significant contribution to schools bridge. 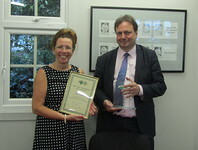 She is pictured receiving the award from EBU Vice Chairman, Ian Payn. This summer is a great time for youngsters to start playing bridge, or improve their game. There are lots of sessions going on, whether weekly events or residential weekends (including EBED's Junior Teach-In). See the junior calendar on the EBED website for details of those they know about - get in touch if you know of any more. English Bridge Education & Development has appointed two new Trustees. Andy Margetts and Dom Wilson will join the charity from 1st August.